Detail revealed in MRI brain scans can help doctors accurately deduce when a stroke begins, according to new research, allowing treatment for many patients who currently cannot receive it. The findings could help to better treat stroke patients, particularly those who wake up with stroke symptoms. Currently, those patients who do not know when their stroke began are not routinely eligible for clot-busting treatment, which is only able to be used a few hours after stroke symptoms start. The WAKE-UP trial – a major European study, which was led in the UK by the University of Glasgow – found that doctors were able to select patients who would benefit from clot-busting treatment based on the information from two different MRI scans. The study is published in the New England Journal of Medicine and the findings were presented at the European Stroke Organisation Conference (ESOC). Up to 20 percent of stroke patients wake up in the morning with stroke symptoms. This means that the time when their stroke started is unknown and, as a result, they are not routinely eligible for clot-busting treatment (thrombolysis), which is only approved to be used within 4.5 hours after the start of stroke symptoms. Every year there are estimated to be over 100,000 strokes in the UK, including over 20,000 in patients with 'wake-up stroke' or who otherwise have an unknown time of symptom onset. Patients were studied using a combination of two different MRI sequences. The first scan, called diffusion weighted imaging (DWI), shows early changes in the brain after stroke, whereas changes take several hours to become obvious in the second type of scan called FLAIR (fluid-attenuated inversion recovery). If changes are visible on one type of scan (DWI) but not the other (FLAIR), then a patient's stroke is likely to have happened in the preceding 4.5 hours. The trial tested whether people with this pattern benefitted from thrombolysis using the clot-busting drug alteplase. Treatment with alteplase gave a significantly higher rate of full or nearly-full recovery 3 months after the stroke: 53% of patients treated with alteplase made a full or nearly-full recovery compared to 42% in the placebo group, representing an absolute increase of 11.5%. This means that for every 9 people treated, one extra person made a complete recovery. Professor Keith Muir, SINAPSE Chair of Clinical Imaging at the University's Institute of Neuroscience & Psychology, and Chief Investigator and coordinator of the trial in the UK, said: "Clot-busting drug treatment is effective only in the first few hours after a stroke, so it has not been possible up until now to treat patients when the stroke happens during sleep, for example. This involves as many as 1 in 5 people affected by a stroke. "The WAKE-UP trial proves that we can use MRI scanning effectively as a timer, and that treating people with an MRI pattern indicating likely onset in the preceding few hours is highly beneficial. 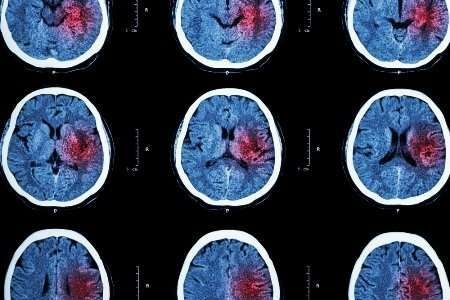 "The trial should significantly increase the opportunities for treatment in stroke. Around 1 in 3 of the patients enrolled in the trial had the MRI signature of recent onset, and could be expected to be eligible for treatment that they have been unable to receive in the past. This translates into several thousand additional people per year in the UK. "This important advance brings the possibility of treatment to many more stroke patients, but the challenge is to ensure availability of immediate MRI scanning. Unlike other countries, the UK has very poor access to emergency MRI, so it will need the UK to make immediate access to MRI scanning a priority." Juliet Bouverie, Chief Executive at the Stroke Association, which was a consortium member on the trial, said: "These findings could be a game-changer for the thousands of people who have a stroke in their sleep so can't receive thrombolysis. "Stroke is a medical emergency and there is a only a small window of opportunity to receive treatment that can reduce brain damage. The impact of a stroke means it can affect someone's mobility, vision, memory and even their personality, robbing them of the life they had. "Everyone who has had a stroke should be given the best chance of recovery. If the use of this new brain scan technique were rolled out across the UK, it has the potential to save thousands of stroke survivors from serious physical and mental disability."